Moraga, Calif. • BYU basketball coach Dave Rose never talks about Luke Worthington without mentioning the Cougars’ 6-foot-10 senior captain is one of the best leaders he’s coached in 35 years in the business. “Maybe the best I’ve ever been around, and a great teammate, too,” Rose says. 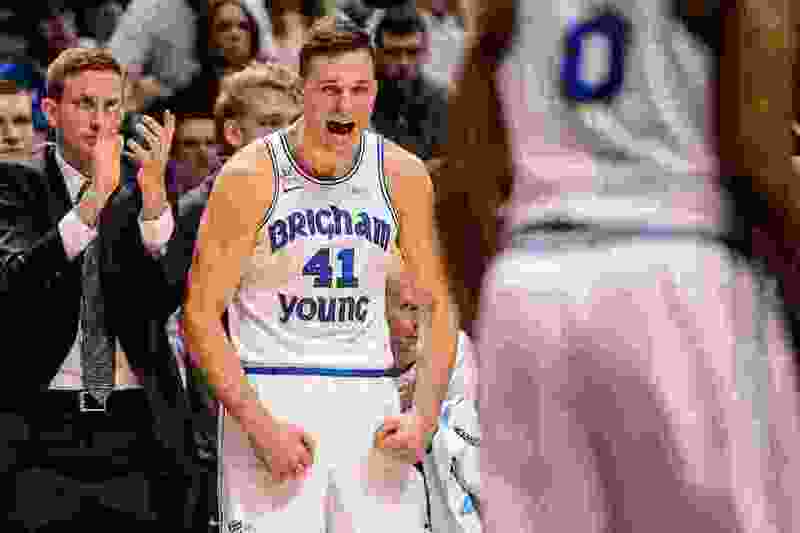 Lately, Worthington has been a major contributor on the court as well as he wraps up his BYU career that started in 2013-14 and was interrupted after two seasons by a two-year church mission to Chile from 2015 to 2017. Worthington got his second start of the season — the first was against Utah Valley back on Nov. 9 — in Thursday’s 90-87 win over Pacific and delivered eight points (on 3 of 3 shooting) and three rebounds in the West Coast Conference opener. He did miss two free throws in the first minute of the game and two more with three minutes, 54 seconds remaining, but also had a much-needed 3-point play five minutes into the second half and hit the go-ahead free throw with 2:07 left to give BYU an 82-81 advantage. He finished 2 of 7 at the line to drop his season percentage to 69 percent after it was a career-high 84 percent (16 of 19) entering the game. Rose said he started Worthington and fellow senior McKay Cannon in the places of juniors Zac Seljaas and Jahshire Hardnett to reward Worthington for playing well off the bench in the recent losses to San Diego State and Mississippi State and because Cannon is one of the team’s best game-prep guards on the defensive side. Worthington had scored a season-high 11 points and grabbed five rebounds in 21 minutes against SDSU, then followed that with eight points and six rebounds against MSU. He had just 27 points and 24 rebounds in BYU’s first 13 games. Worthington said they key has been letting the game come to him, and not panicking when he gets a chance to play after starting in 29 games last year and averaging 14.7 minutes per game. He’s also figured out how to complement star forward Yoeli Childs when they are on the court together. The Cougars stayed in the Bay Area on Friday and will play at Saint Mary’s on Saturday night at 9 p.m. MST on ESPN2. The Gaels (9-7) dropped a 76-72 decision across the bay at red-hot San Francisco on Thursday and have struggled against an upgraded non-conference schedule much like BYU has. It will be BYU’s fifth-straight game away from the Marriott Center. At McKeon Pavilion, Moraga, Calif.
About the Gaels • The lost 76-72 at San Francisco Thursday night despite 24 points from Jordan Ford on 9-of-18 shooting. Ford leads the WCC in scoring at 22.7 points per game. … Six of their seven losses have been by six points or fewer. … They had eight steals in the USF game and committed just nine turnovers. … Malik Fitts, a transfer from South Florida who is a redshirt sophomore, is second on the team in scoring with a 14.3 average and lead the team in rebounding at 8.3 boards per game. He has four double-doubles this season. About the Cougars • They shot 60 percent in the first half (18 of 30) and 40 percent in the second half (10 of 25) in Thursday’s 90-87 win over Pacific in their WCC opener, including 9 of 17 from 3-point range in the first half and 2 of 8 from deep in the second half. … They got 31 points from their bench, most notably 17 from junior guard Jahshire Hardnett. … They were plus-nine on points off turnovers, after being minus-20 in that category in the losses at San Diego State and Mississippi State.